This blog originally appeared on campaign group Farms Not Factories’ website, here. Public awareness that antibiotics are on the wane as, arguably, the most effective weapons in western medicine’s arsenal has been increasing over the last decade. What is still foreign to many is the idea that food production could be a major culprit in the development of deadly drug-resistant human diseases. After all – it’s not particularly intuitive. It’s not difficult to grasp that bacteria will mutate and evolve to withstand drugs, prescribed to humans, designed to kill them. With fewer new drugs in the pipeline, the medicine cupboard is being depleted. But what on earth does this have to do with a simple old sausage? It all goes back to the farm – or more often these days – the factory. With intensive livestock production (‘factory farming’) now the norm in Europe, the US and other industrialised nations, a new threat to public wellbeing (sitting snuggly alongside environmental destruction and various dietary related diseases) has risen: routine antibiotic overuse. One of the many costs of intensively farming livestock is that the confined, enclosed ‘environments’ in which animals are reared are, fundamentally, unsanitary. It is a constant battle to keep animals healthy, or even alive. Imagine a barn packed with hundreds, perhaps thousands, of animals all living, eating, excreting and sleeping in the same space. It is inevitable disease will be bred – and when it breaks out it can sweep like wildfire through a whole herd. 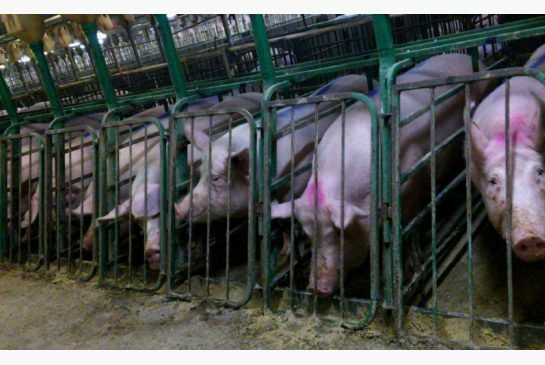 Canadian sows confined in ‘gestation crates’. They will remain their almost all of their lives. The ‘solution’ is antibiotics use, to combat infection. The drugs facilitate concentrated livestock operations, allowing more animals to be packed into tighter and tighter spaces. But the drugs are not used only when an animal falls sick. On the contrary, they are often administered ‘prophylactically’ (preemptively, before an animal becomes ill). The use of antibiotics preemptively is cost-effective – despite having to buy in the drugs, this outgoing is offset by the economic returns from the intensive production model. And so it goes. The level of antibiotic use differs from country to country – in the US the Pew Charitable Trust estimates that a chilling 74% of all antibiotics sold in 2011 were used not on people, but on food animals. Incredibly, some of these are used in feed as growth-promoters (i.e. not even as prophylactic medicines), a practice banned in the EU. In Denmark however (a country with a significant factory pig farm industry), antibiotic use has been radically reduced through government and industry cooperation over two decades (showing that factory farming can, for better or worse, be done without preemptive antibiotic use). In the UK, around 60% of antibiotics are used on animals (including pets), while around 27% alone go on pigs. So, what’s the problem? It turns out that genes in animal strains of bacteria, such as ‘Pig MRSA’, that develop resistance due to antibiotic use can in fact transfer into human strains, causing them – in turn – to become drug resistant. The use of drugs preemptively usually requires lower doses: perfect conditions for resistant gene evolution. There is also evidence of animal strains of bacteria themselves passing into humans, through farm workers, meat handlers and, of course, meat consumers. From there they can spread through human populations easily. Separately, the UK Government published its 5 Year Antimicrobial Resistance Strategy this September, which acknowledged the role of livestock antibiotic use in drug-resistant human disease evolution, following the UK Chief Medical Officer, Sally Davis’, report in March 2013. The fact is that increasing bacterial drug-resistance – and the subsequent erosion of one of the greatest medical discoveries of all time – is yet another hidden cost of so-called ‘cheap’ meat. Without antibiotics everyday infections could kill and maim – routine operations simply wouldn’t be worth the gamble. We risk, as Sally Davis says, slipping back ‘200 years’. While not solely responsible, factory farming is nevertheless choosing to trade vital human medicines for cheap meat we simply don’t need to eat. High-welfare, extensively farmed and organic produce uses few or no antibiotics. By looking for ‘outdoor reared’ and ‘organic’ labels you’ll buy better quality meat, and make critical drugs go further too. Wow, that makes for a heart-breaking read, not to mention panic-inducing – the Pew stat is shocking. What are the different ways ppl can do something about this? Hi Tess, for a start, make sure you avoid factory farmed pork, and meat, in general. See ‘useful labels to know’ here: http://www.farmsnotfactories.org/take-action/act-as-a-consumer/. Second, you could sign this petition opposing what would be the largest factory pig farm built from scratch in the UK (25,000 pigs!) here: http://www.change.org/en-GB/petitions/object-to-the-introduction-of-huge-factory-farms-into-the-uk. Third, watch and share Pig Business (http://www.farmsnotfactories.org/the_film/) to find out more and spread the word.